This source code is copied from this site -> http://docs.opencv.org/modules/core/doc/basic_structures.html for our convenience. We can get rect information and rotatedRect information from RotatedRect variance. From the above source code, green line is drawn by line function for describing rotated rect. And Blue line means outlier rect of target. 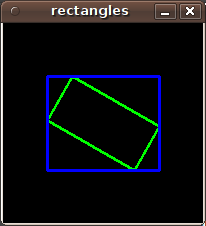 It is drawn by rectangle function.